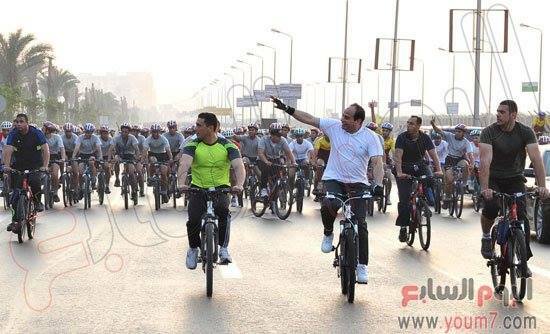 President Abdel Fattah Al-Sisi taking part in a cycling marathon earlier today. 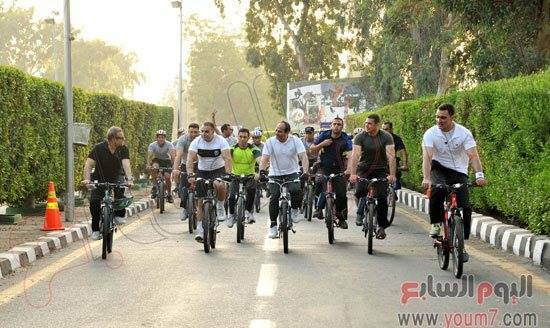 Strongman President Abdel-Fattah Al-Sisi spent his morning cycling with Prime Minister Ibhrahim Malhab and several members of the Egyptian cabinet. The former Field Marshall participated in a marathon held from the Military Academy for 20 kilometers, in which the Egyptian President was at the head of the race from start to finish. 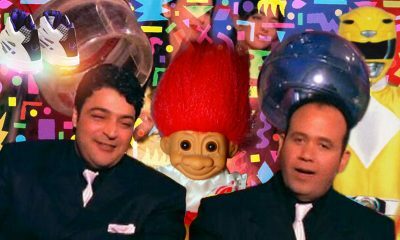 President Al-Sisi at the marathon earlier this morning. 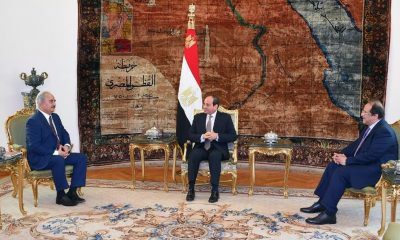 “Our objective is not just to promote exercising and activities, but to symbolize unity; our unity as a nation,” said President Al-Sisi. Some of the ministers that took part in the athletic day were Minister of Defence Sobhy Sedky, Minister of Interior Mohamed Ibrahim, Minister of Youth and Sports Khaled Abel Aziz and Minister of Social Solidarity Ghada Waly. Several artists, public figures, journalists, university students and students of the Military and Police Academy attended the marathon. 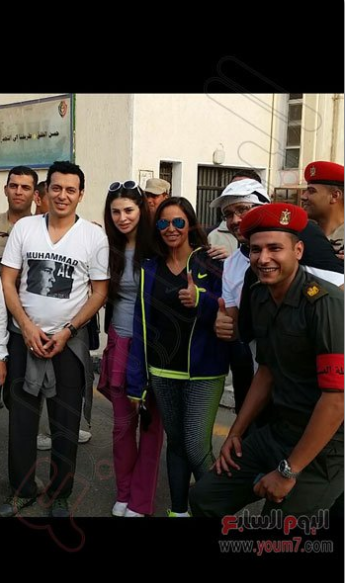 Several actors and actresses attended the marathon held at the Military Academy. The President explained in his speech how the use of alternative transport solutions will save for the average Egyptian EGP 4 ($ 0.56) and the government EGP 8 ($ 1.12) per a 20 kilometer travel distance. President Abdel Fattah Al-Sisi led the race. 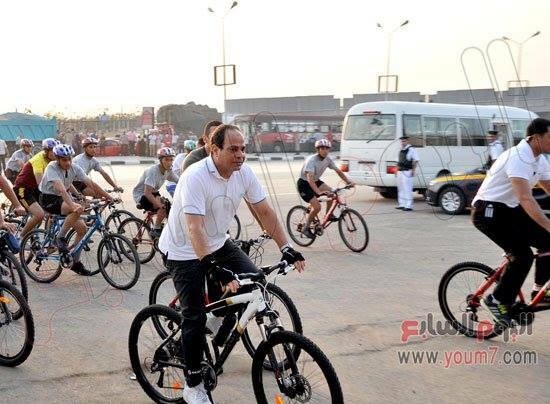 This is not the first time President Al-Sisi has promoted alternative use of transportation; two months ago Al-Sisi caused a stir on social media after he was photographed cycling in New Cairo, where he allegedly stopped to talk to locals about his cycling hobby. A recent study released by the World Bank reveals that Cairo’s traffic costs the Egyptian state EGP 47 billion (USD 6.5 billion) annually and is expected to reach EGP 105 billion (USD 14.6 billion) by 2030.
reach EGP 105 billion (USD 14.6 billion) by 2030.